Welcome to the WOW! 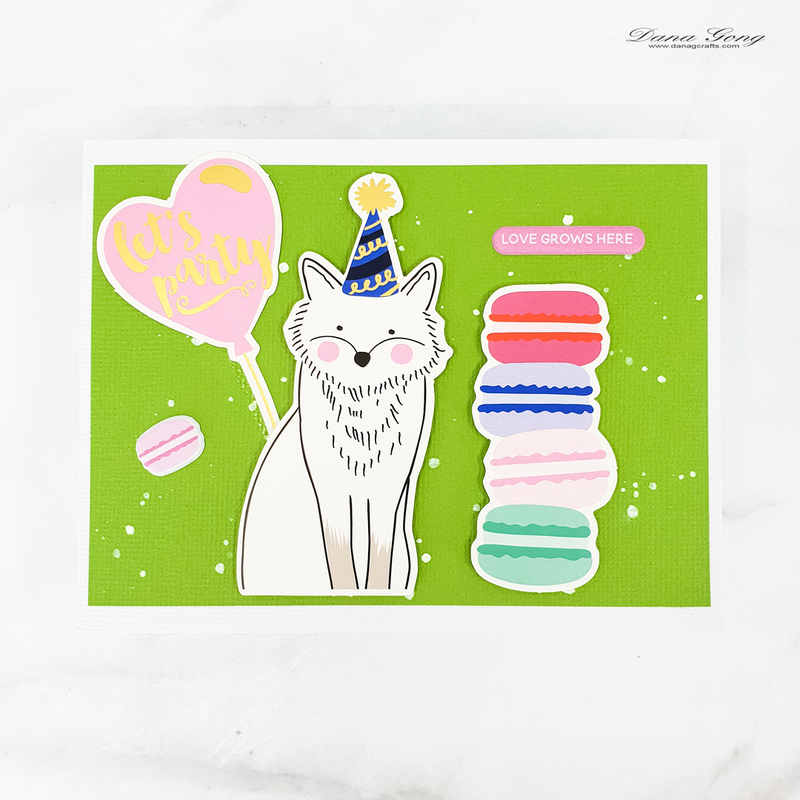 Embossing Powder and Whimsy Stamps Collaborative Blog Hop! 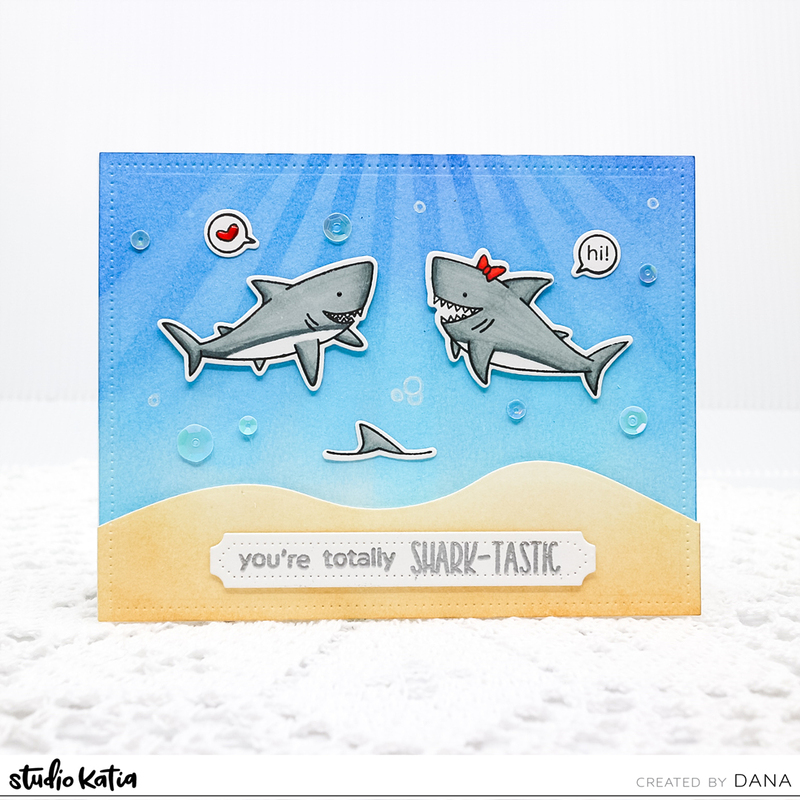 It's Dana here and I'm so excited to being part of this special blog hop. 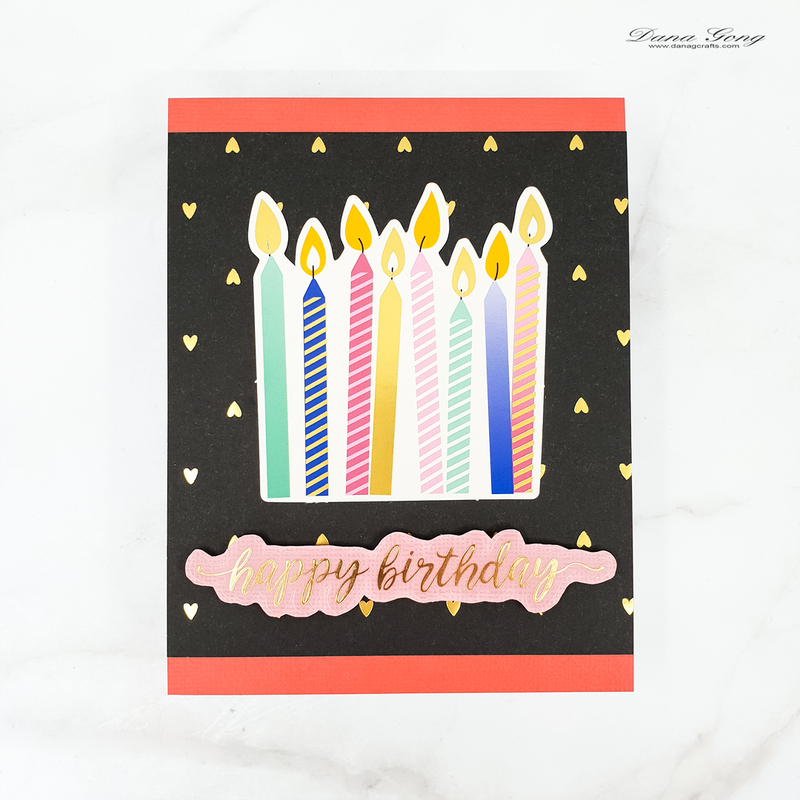 Hopefully you are from amazing Karen's blog, but if not, please check out full blog hop list at the bottom of this post. For today's card, I started by ink blending A2 sized white cardstock using Dried Marigold and Spiced Marmalade Distress Oxide Inks. I then die cutting circle frame and put it aside for next step. 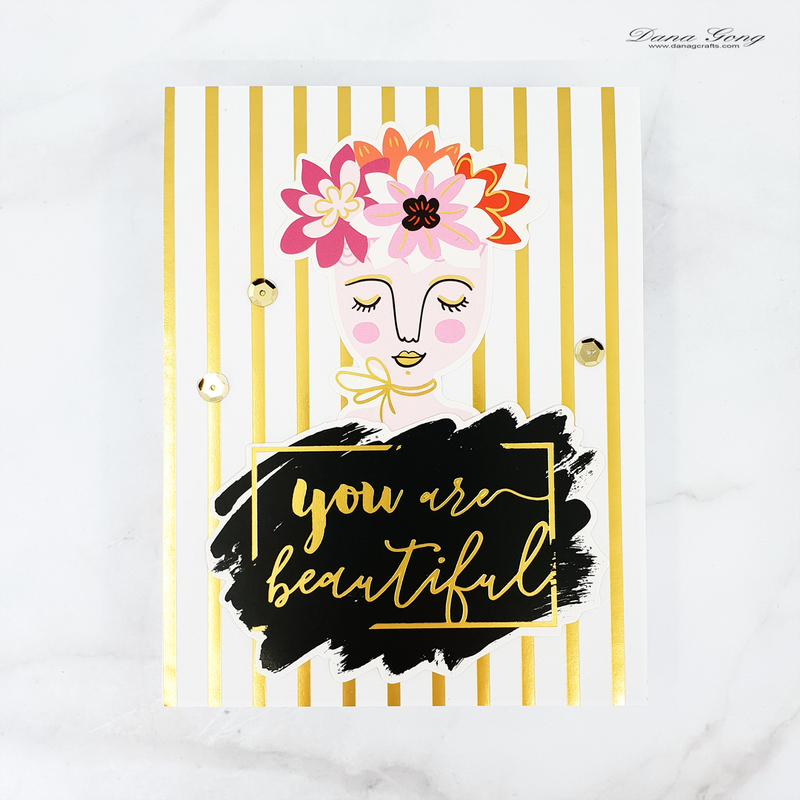 I stenciled background panel with Whimsy Stamps Dotted Rounds Stencil using WOW! Embossing pad and mini dauber. I sprinkled WOW! 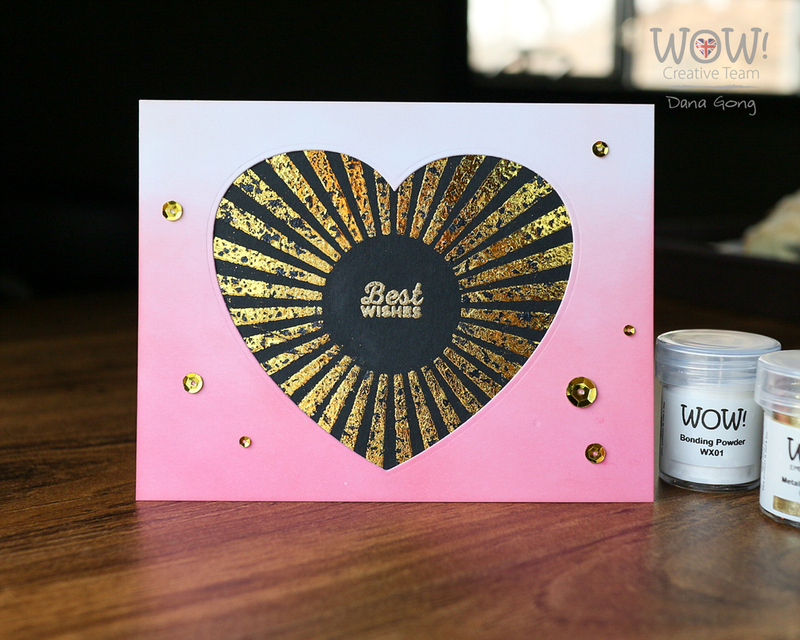 Aladdin Embossing Glitter and heat set it using WOW! Dual Speed Heat Tool. 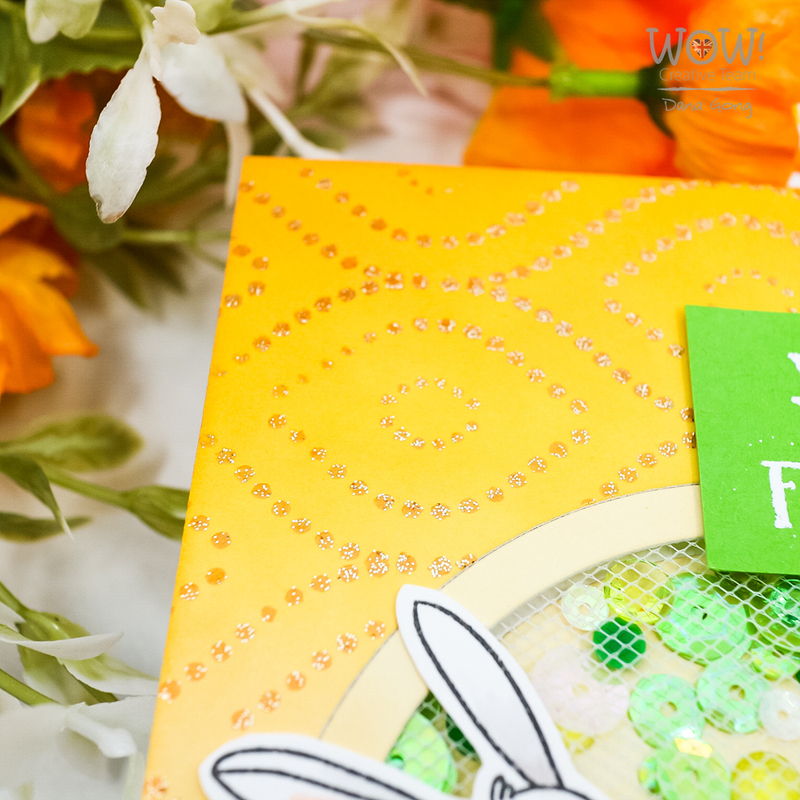 Next, I stamped bunny and carrot images from Whimsy Stamps Hugs Bunny Stamp Set onto WOW! Superior Smooth White Cardstock. I cut them out using scissors and colored them with Copic markers. I also heat embossed a sentiment from same stamp set in white using WOW! Opaque Bright White Embossing Powder. I added circle and circle frame where they were from using paper tape at the back and mounted tulle as well using double sided tape. Then, I foam mounted background panel after I mixed some sequins and crystals as shown in the picture. To finish, I adhered all elements where I wanted them using glue and foam adhesive. No Blog hop is complete without a prize! WOW! Embossing Powders has 6 powders of your choosing along with a WOW carry case to store your powders safely in. 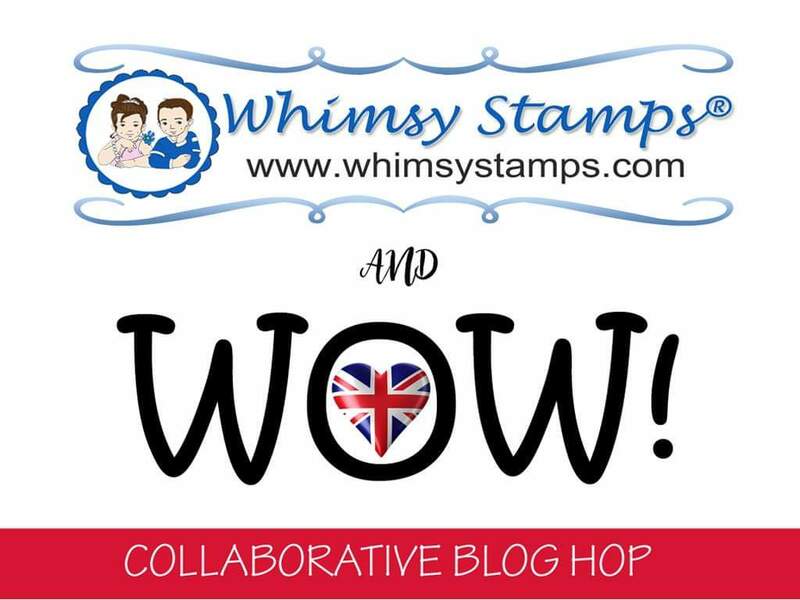 Whimsy Stamps is giving away a $25 gift certificate to their store. The Winners will be chosen at random in the week of the of 22nd April from the comments left on ALL THE POSTS. To join this GIVEAWAY you must leave a comment on each blog post to have a chance at getting your hands on the prize. This hop is open internationally. You are at the end of blog hop. If you missed some stops, don't forget to stop by all blogs and get more chances to win the prizes! Happy hopping, everyone! Hello, everyone! 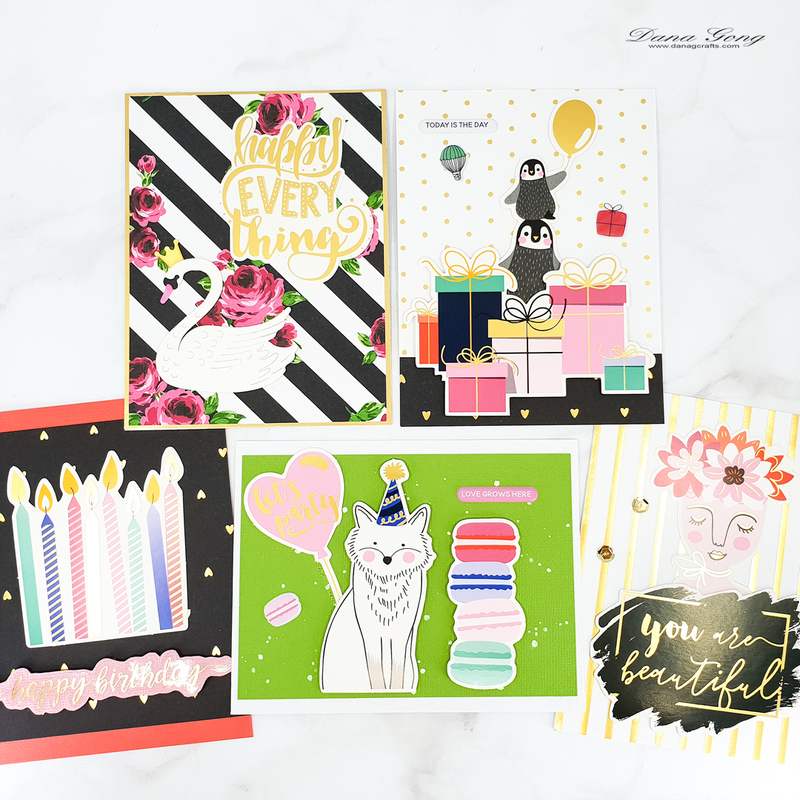 Welcome to the Studio Katia March Release Blog Hop! 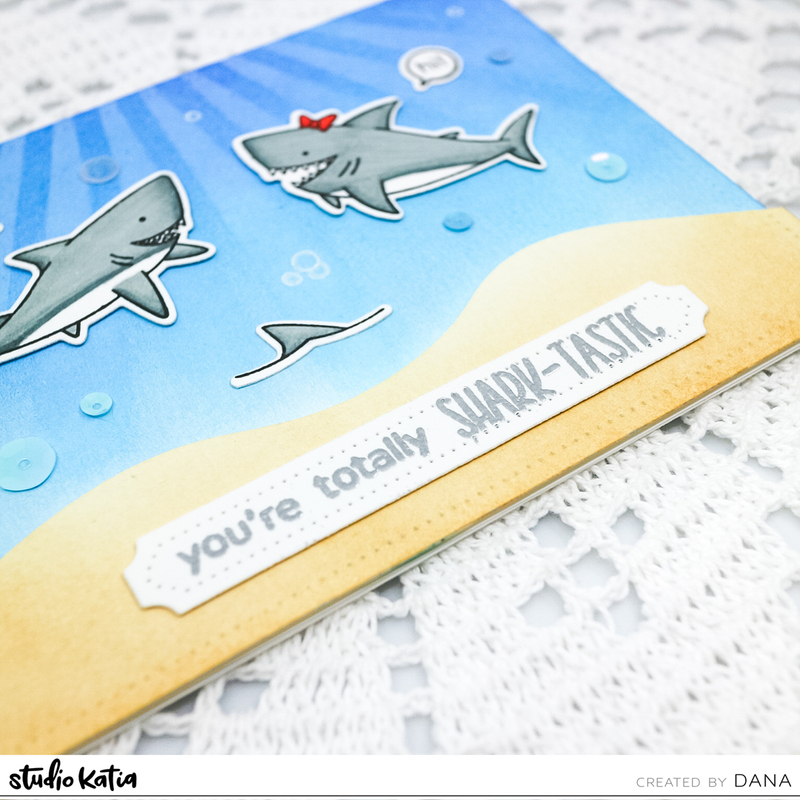 It's Dana here and I'm so excited to share new products from Studio Katia today. 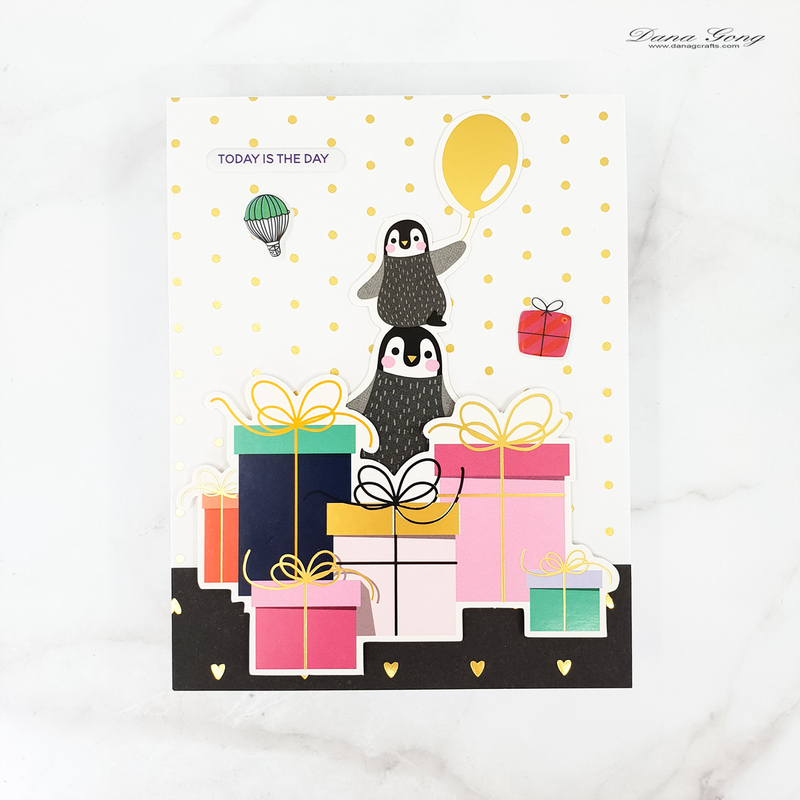 Hopefully, you should have arrived here from amazing Ilda's blog, but if not, please check out full blog hop list at the bottom of this post. 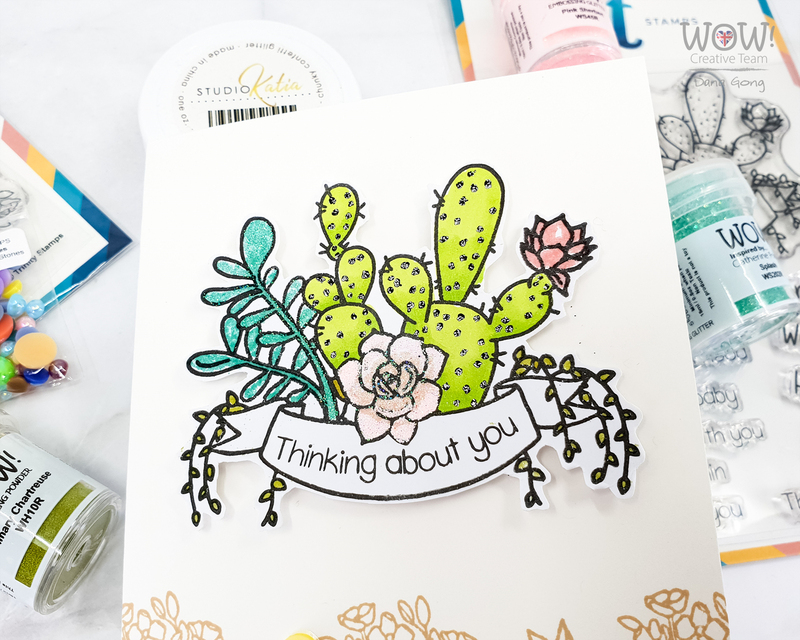 This release includes 7 new clear Stamp Sets, 6 sets of Coordinating Dies, 5 new stand alone Creative Dies, 6 new Stencils and a new Embellishment! 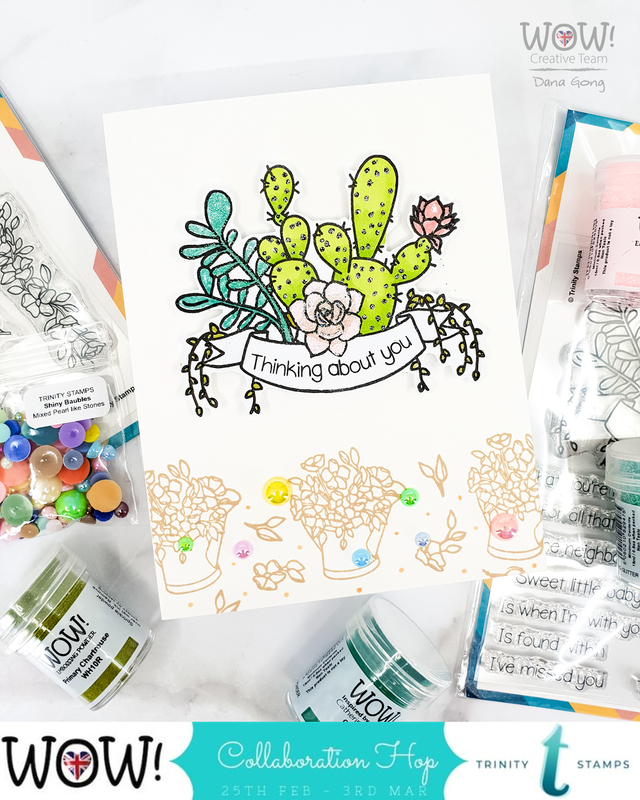 I have one card featuring 3 products and let's get started! I began by ink blending the background with distress inks using mini blending tool on A2 sized watercolor papers. I used Blueprint Sketch, Mermaid Lagoon, Antique Linen and Tea Dye colors. I pulled out Studio Katia Underwater Sun Rays and stenciled background with it using white pigment ink and mini dauber. 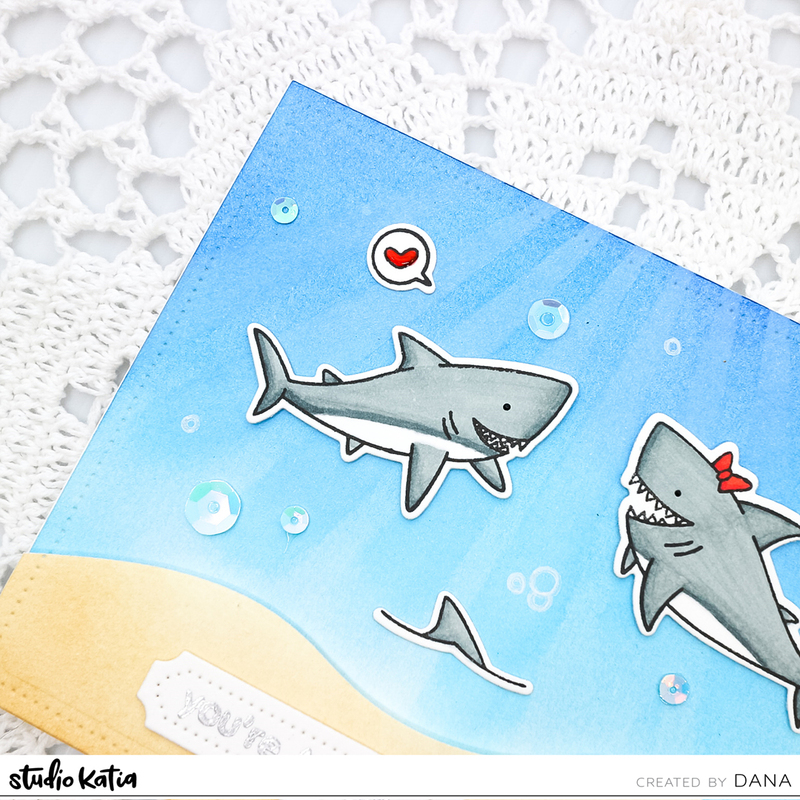 I then ran them through my die cutting machine with Studio Katia Dotted Patterns: Darling Ribbon. I also created a banner for sentiment using this die set. 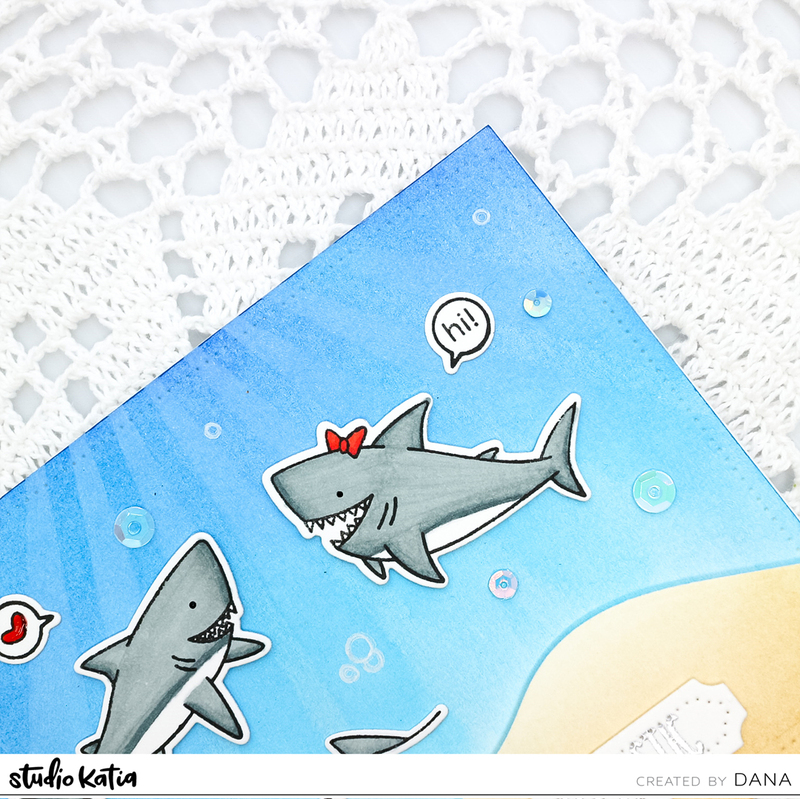 Next, I stamped Studio Katia Jawsome Stamp Set images onto white card stock. I colored them in with Copic markers and cut them out using Coordinating Dies. I also applied Nuvo crystal drops to small heart and their eyes. 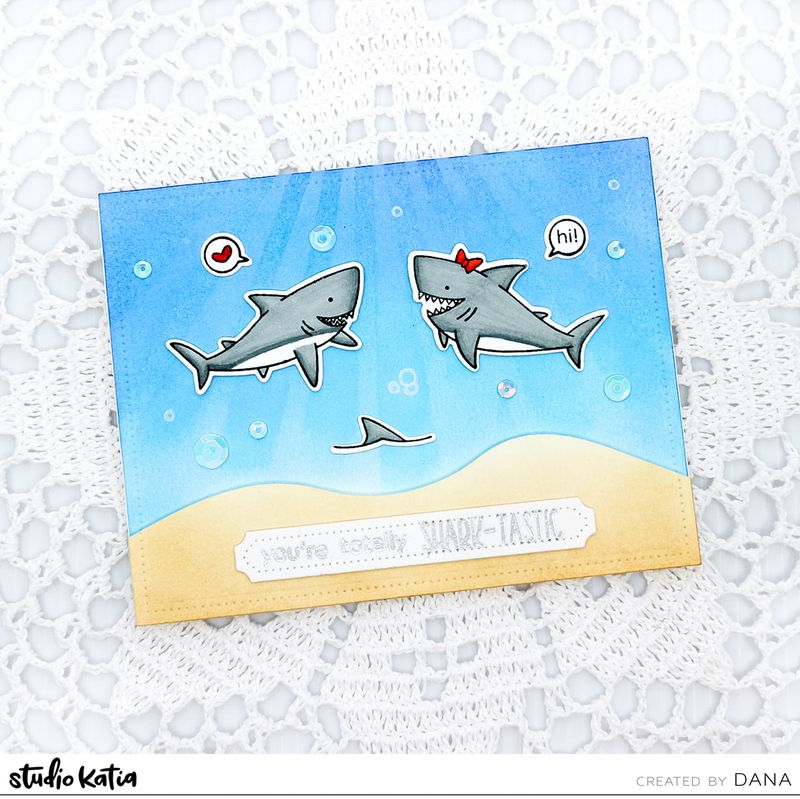 Sentiment from Studio Katia Jawsome Stamp Set was heat embossed in silver. I popped up all images using foam tape as shown in the picture. To finish off, I embellished with Studio Katia Blue Sky Fusion here and there. 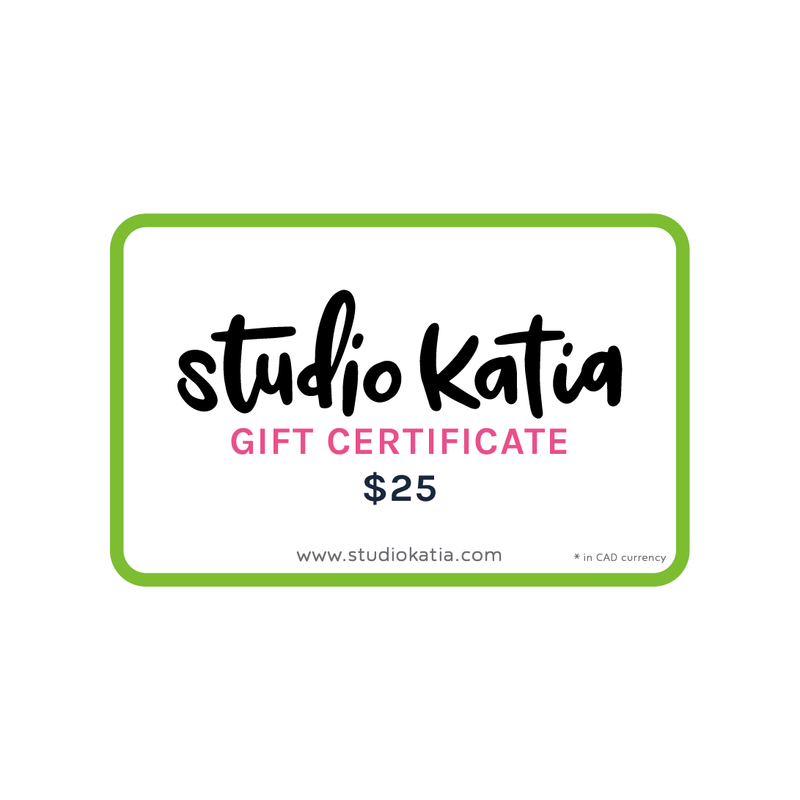 Studio Katia is giving away ONE $50 CAD gift certificate on their Blog. 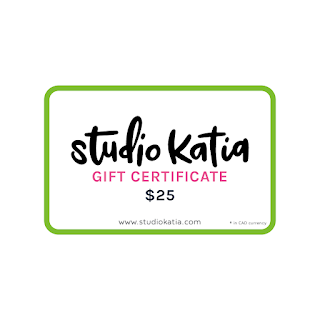 Winners will be chosen randomly from comments left on Studio Katia Blog. - Make sure to leave all the comments by Friday, March 22nd, 2019 11:59 PM EST. All winners will be announced on Sunday, March 24th, 2019 on the Studio Katia Blog. Your next stop is Laura's blog. Don't miss out her beautiful card! Happy hopping and good luck, everyone! I'm sharing my card I made for WOW! 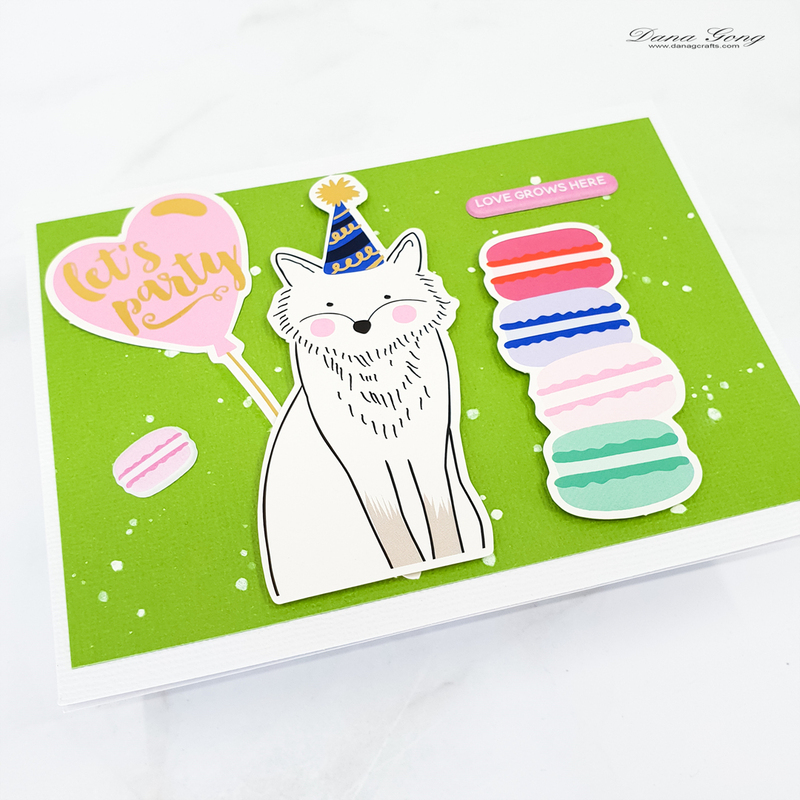 Embossing Powder Monthly Challenge. This month's them is 'Foils' and here is what I came up with. To start, I stenciled image using WOW! Embossing Clear Ink Pad and mini dauber on black card stock. 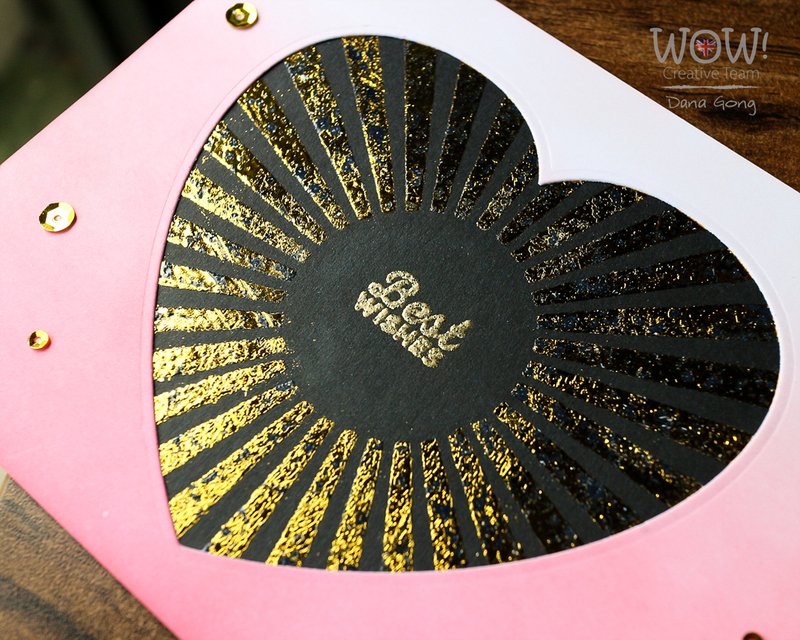 I heat embossed it with WOW! Boding Powder. I then took WOW! Gold Fab Foil on it and rubbed slightly it with my fingers. I repeated this process several times. For sentiment, I heat embossed it using WOW! Metallic Gold Sparkle Embossing Powder. I covered black panel with heart die cut panel I created for one of my latest projects. As a final touch, I embellished with gold sequins as shown in the picture. Now it's your tune! Don't forget to link your project HERE and get a chance to win WOW! gift certificate! 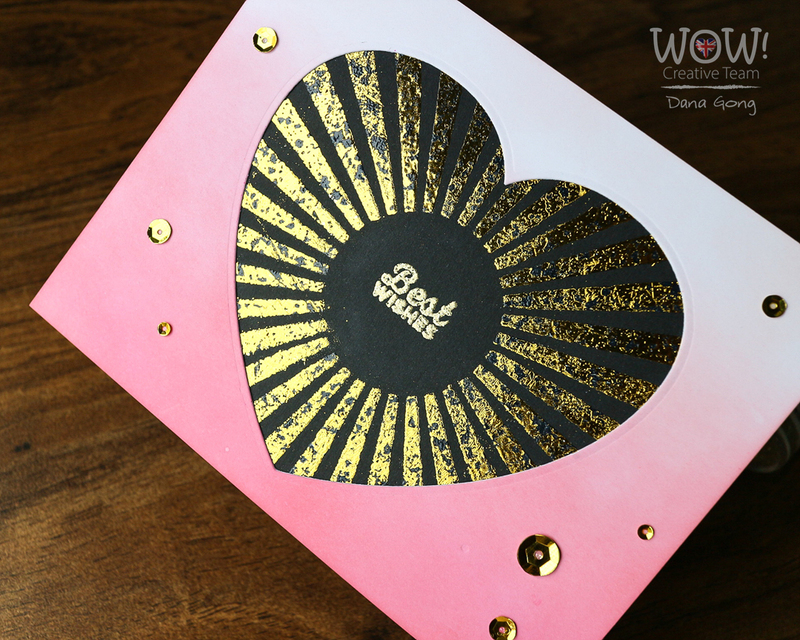 I'm sharing my cards using February Spellbinders Card Kit of the Month. 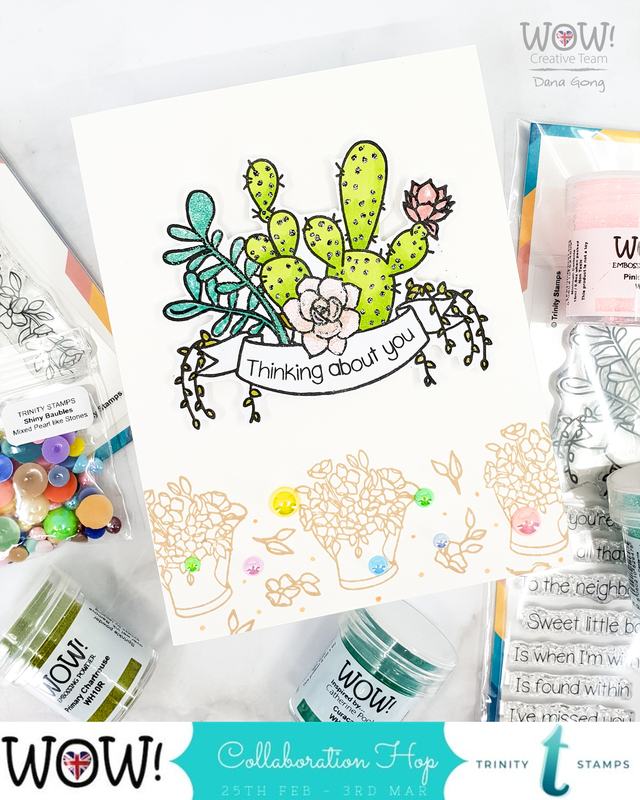 There are lots of fun and beautiful elements in this card kit! I created 5 cards using only February Spellbinders Card Kit of the Month as shown in the picture. Welcome to the WOW! 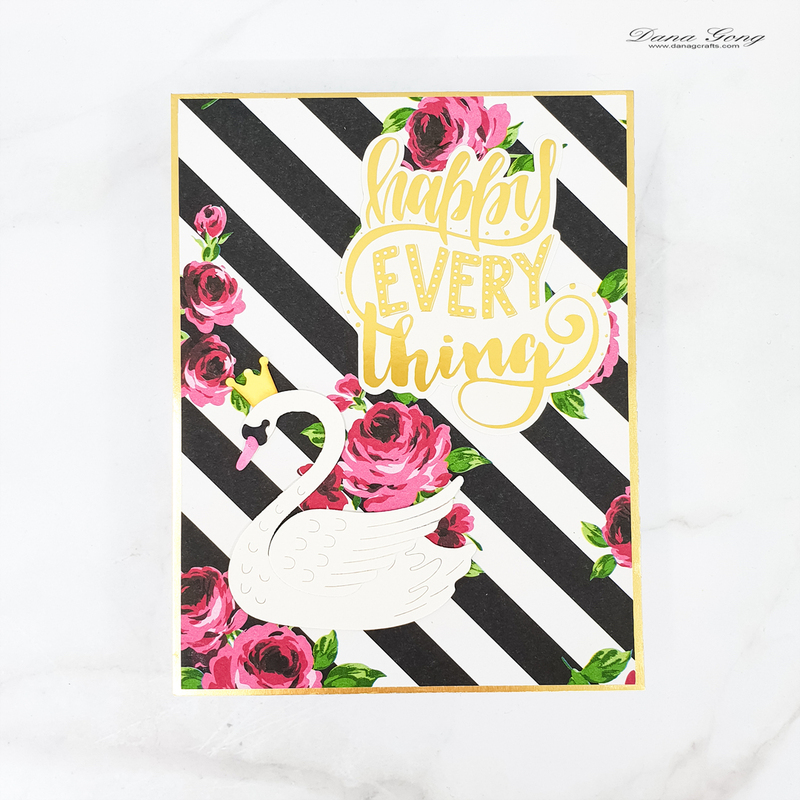 Embossing Powder & Trinity Stamps Blog Hop! It's Dana here and I'm so excited to be part of this amazing party today. Hopefully you came here from Emily's blog, but if you lost your way, please check out full blog hop list with giveaway information at the bottom of this post. For today, I featured variety of products from WOW! Embossing Powder and Trinity Stamps. Here is what I came up with. To start, I stamped image and sentiment from Trinity Stamps Succulent Banner Stamp Set onto white card stock in black and cut out using scissors. I then colored succulent with Copics and added colors to other images using embossing powders. I scribbled WOW! 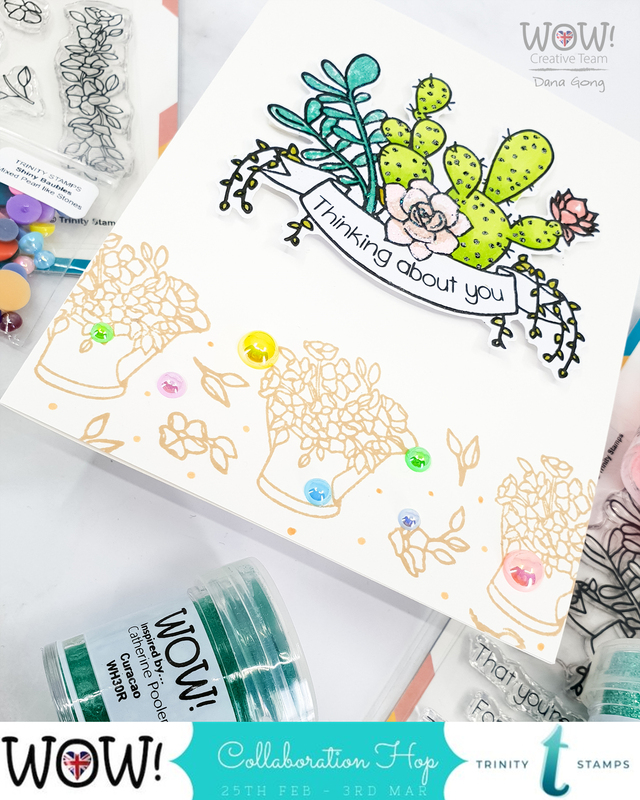 Embossing Pen and sprinkled WOW! embossing powders in each image. I heat embossed image using WOW! Dual Speed Heat Tool and repeated this process several times. The embossing powders I used are as shown in below. Primary Chartreuse Embossing Powder for small leaves. Next, I stamped Trinity Stamps Hopeful Flowers Stamp Set images in light brown color where I wanted them. I added small dots between the images using Copics. To finish off, I popped up banner using foam adhesive and embellished with Trinity Stamps Shiny Bubbles. 6 x powders (at the winners choosing) + carry case from WOW! 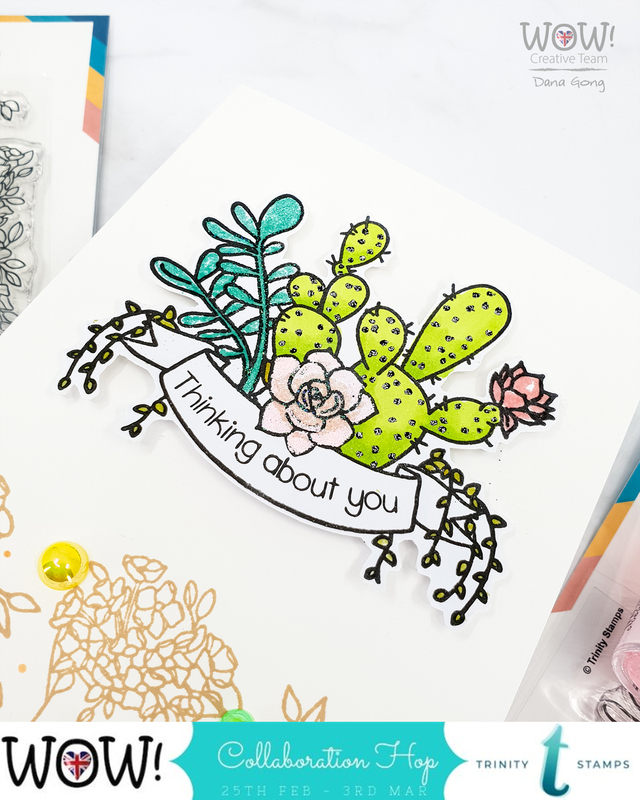 Embossing Powder & Trinity Stamps have an amazing pack of goodies with Stamps, Die and Embellishments. 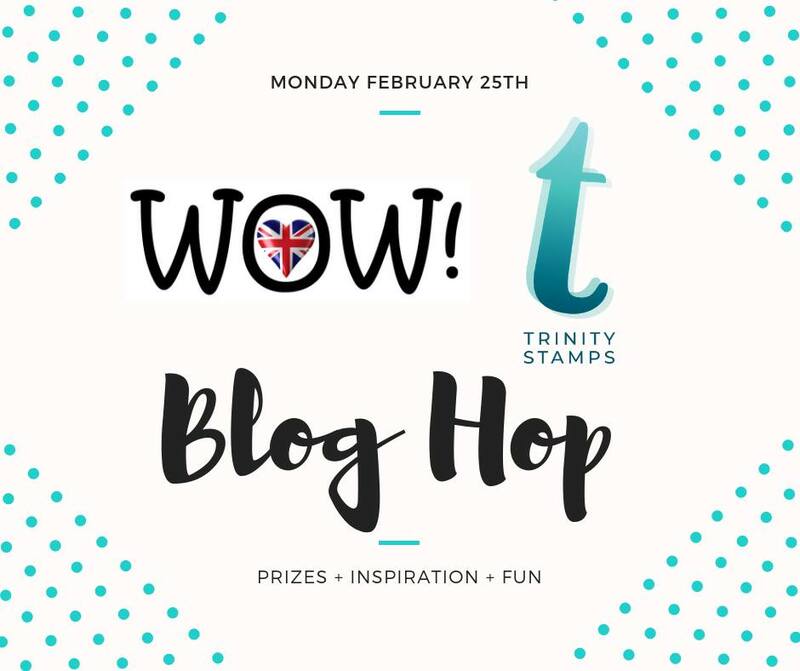 Winner will be announced on both Trinity Stamps & WOW! Embossing blog on Wednesday, 16th March 2019. Your next stop is amazing Raluca's blog. Happy hopping and good luck everyone!